Are you looking for an affordable and reliable shower radio? Are you tired of purchasing a new shower radio every other time? Then worry no more because today I will inform you about the best shower radios. Many people if not everyone like to sing in the shower. One way to keep the music playing while you are in the shower is making use of a shower radio. These gadgets have evolved over the years, not like the bulky ones used in the 1990s and early 2000s. Modern shower radios today are rechargeable or use batteries. They also have better reception for radio stations and the ability to connect to a smartphone via Bluetooth for you to listen to your favorite music, podcast or the latest news of the day. When purchasing a shower radio, you need to pick the product that suits your needs. You might need a radio that connects to multiple electronics or just something basic. This article will focus on the best shower radios you can get in the market today. Let’s explore! The Sangean H201 is a highly capable shower radio that keeps you entertained and informed virtually everywhere with its waterproof capabilities and specifications. 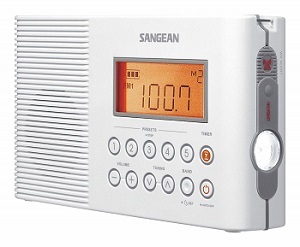 Tuning, the Sangean H201 has a unique tuning operation with ten presets stations, auto-seek capabilities, FM/AM/Weather stations. You can quickly search, or your favorite station by just clicking a button and the information displayed on its LCD backlit screen for the future status purpose. Power Source, the Sangean H201 power source relies on its two D-cell batteries that are easily replaceable. The Sangean H201 has JIS7 waterproofing materials and standards making it ideal for any marine environment that includes the beach, the showers, sea or the lake. The speakers and buttons are powerfully protected preventing water from getting in and ensuring the device safety. 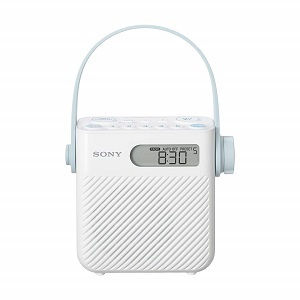 The presets of this radio makes it easy to switch between different stations and it also has the push button and auto-seek features making it more convenient. It comes with an LCD screen for easy reading of the frequency accuracy and it very versatile. 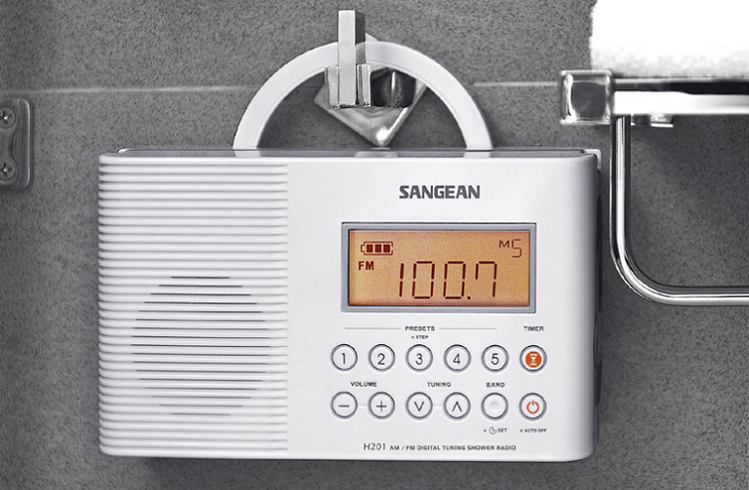 The Sangean H201 also has the bracket making it easy to hang where needed. 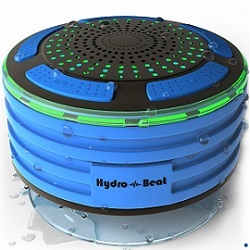 The Hydro Beat Box shower speaker is super versatile, and it easily connects to other devices that are Bluetooth enabled. 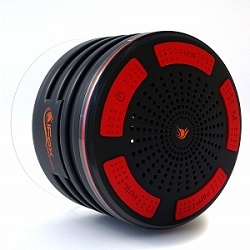 It is a sleek, durable, compact and waterproof speaker that is designed to keep you entertained in the showers. Wireless Bluetooth 4.2, this means that the Hydro-Beat Box speaker has a range of 115ft making it ideal for marine adventures. Universal compatibility, it comes with highly effectiveness wireless technology that enables it to connect with all Bluetooth enabled devices like Macbook, Mac, iPod, and MP3 players. Crystal Clear Sounds, the Hydro-Beat Box speaker has a dynamic and clear digital sound, bass subwoofer and great volume creating an enriched and captivating listening experience. 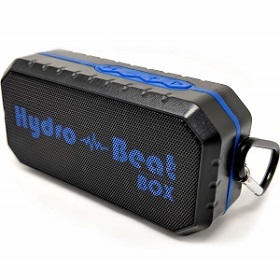 The Hydro-Beat Speaker has the quick release clip that makes it portable. You need to clip it on and enjoy your day. It acts as a radio shower by playing the radio app through the connected devices. It has an intelligent interface giving the user ultimate control or the radio, sounds, and volume. The integrated microphone makes it easy to receive calls making it multipurpose. 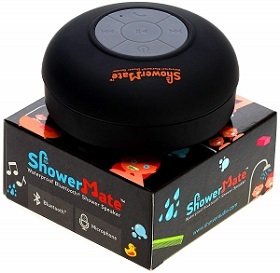 The Shower-Mate Bluetooth speaker helps in transforming your daily and regular showering time into a unique and memorable adventure. It has a suction cup, and a looks like a baseball in diameter. Superior quality sound, the speaker has a suction cup that makes the sound baffle and clears regardless of the surroundings. It also has a very high quality of the audio chip decoder giving you the perfect sound and experience. Highly Sensitive Microphone, the microphones of Shower-Mate speaker are Bluetooth enabled making it easy to answer and also hold calls conversations comfortable. It also connects perfectly with other Bluetooth devices. It has an excellent sound quality regardless of the volume making it easy to hear perfectly even when the shower is running high. It also has control buttons that are super easy to operate making it easy to skip various songs and also adjusts volumes. The Shower-Mate Bluetooth speaker is super easy to connect to other devices, and it picks up faster within different ranges. The Hydro-Beat illumination shower radios us a fun-sized and portable device that helps in talking out the shower boredom and bringing music to your life. Versatility, the Hydro-Beat illumination shower radio is waterproof, dustproof, shockproof and creatively designed for the marine environment. Bluetooth Wireless, it comes with a highly compact Bluetooth 4.0 that makes it perfect use for a range of 8 meters keeping your devices safe from water damages. It also has an inbuilt mic allowing you to make calls from a distance. The Hydro-Beat Illumination speaker comes with an intelligent interface giving you ultimate control of your music. It also has a removable suction cup for an added versatility and its fast charging. It comes with ten different multi-colored LED lights with scrolling options and a solid color for enhanced mood. The BassPal shower radio speakers are highly designed to give comfort when taking a steam shower and listening to music. It comes with a highly waterproofing rating of IPX7 making it safe for a float or fully submerging in any marine environment. Exceptional audio quality, the BassPal shower speaker has a 5W driver that makes it super clear and its bass is thick and robust making a good sound in any room. Long-Lasting battery, the BassPal shower radio speakers boasts of having a durable and robust battery that lasts for a long time and charges faster. LED mood lights, the BassPal shower radio speakers are equipped with mood lights that synch with the genre of music adding color to your life. You can easily disable the LED lights. 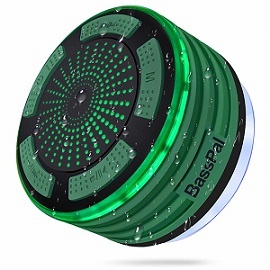 The BassPal shower speaker has suction sup preventing it from floating and attaching it to the wall and this helps the speaker to stay intact. It also has a floating surface that enables it to remain in water surface and to keep its sound closer and clear. This is one of the best radio showers you can find in the market today. It produces excellent sound quality with deep bass and extremely clear treble. The 5 watts speaker in this gadget delivers a booming sound that will make you sing along while in the shower. iFox iF013 has been tested and proved that it is 100% waterproof and can be used in the shower, bathtub, beach, car, bathroom and other places. So whether you are having outdoor or indoor fun this you can use this radio without worrying about splash waters. The iFox iF013 also comes with a suction cup that is used to stick it to shower walls, bathroom tiles, car windows, kitchen counters and any other place that will be convenient when listening to your music. Bluetooth connectivity is available in this fantastic radio shower with a connectivity range of up to 33′ within 4 seconds. It also comes with an optional LED that will add some mood enhancing atmosphere with every beat. Once you decide to purchase this shower radio, you are at no chance of taking any risk since it comes with 100% guarantee money back within 12 months. 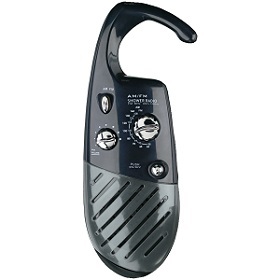 This is an affordable, durable and powerful waterproof shower radio. It has a fully enclosed design that helps to prevent dust and external splashing. The radio can be immersed 3 feet in water and function perfectly for about 30 minutes. Therefore, this device can be used in many areas like in the bathroom, beach, swimming pool, and outdoor fun. The radio has a suction cup that aids in floating on water and sticking to smooth surfaces like tiles, car windows and walls. It is equipped with an anti-distortion feature that ensures the quality of sound produced remains breath-taking. The in-built high quality 5 watts speaker produces deep bass and a clear soft sound that will make you listen to music over and over. The Bluetooth feature is compatible with all other Bluetooth devices. You can connect to your iPhone, iPod, phone and other devices. The shower radio also comes with a powerful lithium battery that can power the radio for a maximum of 8 hours. This radio shower has a built-in LED light and FM radio. The beautiful lighting with many colors will change your party. You can also listen to your desired radio stations in this gadget. The FM tuner has auto scan presets so that you can easily tune to your best channel. Whenever you connect the speaker to your smartphone, you can pick calls. This is achieved through the in-built speakerphone. You do not need to reach for your smartphone while you are in the shower everything is made easy by this device. This is a great shower radio that comes with excellent features to enable you to listen to your favorite music when you are taking a shower. It is splash proof meaning you can comfortably listen to music without worrying about water reaching your device. The gadget also comes with a detachable rubber strap that can be used to hang it in your bathroom. This proves to be helpful when you demand to do something else in the bathroom you have to hang it and enjoy listening to music. It produces state-of-the-art music with speakers uniquely made to produce sound good enough for listening as you take a shower. The battery is on the top game since it lasts up to 100 hours. This radio shower also has an auto power off functionality. This shower radio is equipped with AM and FM reception giving you the opportunity to listen to your loved talk shows, music and listen to the news when you are in the shower. In addition, the radio is water resistant and can also be immersed in water without damaging it. You can simply switch on and off with ease through the indicated buttons. The gadget requires 4 size AAA batteries which are easy to get and fit whenever such a need arises. This shower radio has many features like the traditional radio, but their main uniqueness is being waterproof resistance. It makes it easy to use them in the bathroom or near the pool or any marine environment. This device completes our list of the best shower radio. The first feature that makes it outstanding is portability. It is little in size hence you can carry it anywhere. 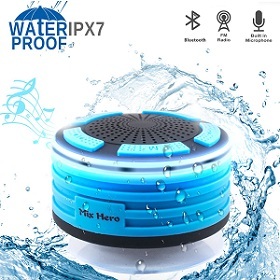 The wireless speaker is water resistant and can be used in the bathroom, camping, swimming pool. It outputs 150mW of power. It is waterproof so it can be used in the shower with no worry of splashing water. It is fitted with marine grade IP44 waterproof design which makes it ideal for wet areas. The speakers also have AM/FM reception with a volume control functionality and a knob for tuning through the channels and an antenna. AM range is from 540-1600 KHz while FM ranges from 88-108 MHz. This radio appears with a hanging strap that gives you the benefits of listening to music wherever you want. Without a doubt, a shower radio is an important gadget you should not lack in your house. Although there are several types of these devices on the market, I recommend the above shower radios for anyone who needs to enjoy value for money when they purchase a shower radio. For people who like to sing in the shower, you cannot afford to miss one of the above shower radios. Apart from giving you the confidence in singing it will help you to sing right. I recommend the above shower radios for anyone who needs to enjoy value for money when they purchase a shower radio. 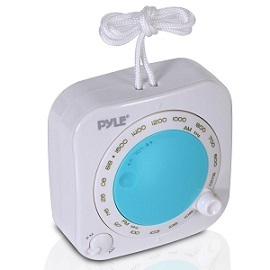 Shower radios offer someone an excellent time to entertain themselves and others. The above shower radios have outstanding, ideal features and capabilities to make your day more charismatic. They are durable are classically designed to blend nicely with any home decor.